Here are my two cards made from this month's Hero Arts sketch contest. I only attempted two of the sketches and will try the third one later this month. 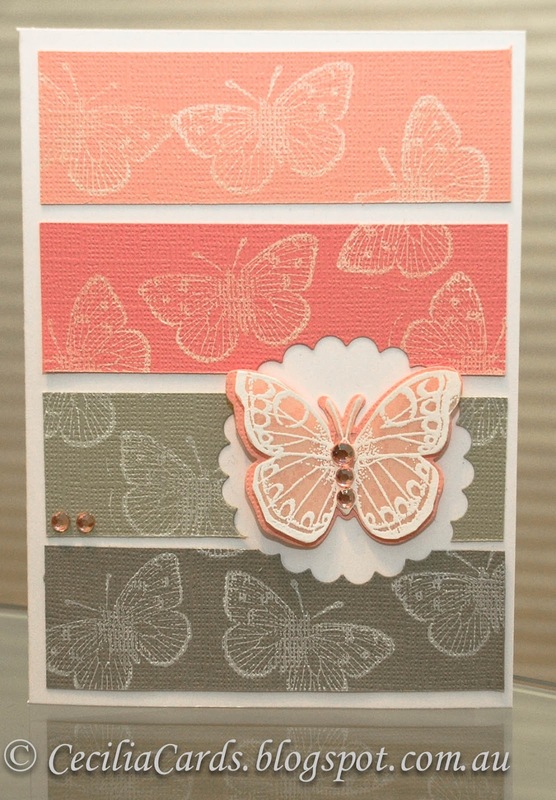 The first card does not have a sentiment as I wanted to use the butterfly to sit within the scalloped circle. The second card is for a friend who just had a baby girl and I wanted to use my new HA stamp (Four Flowers) recently purchased from the Paperific Expo. 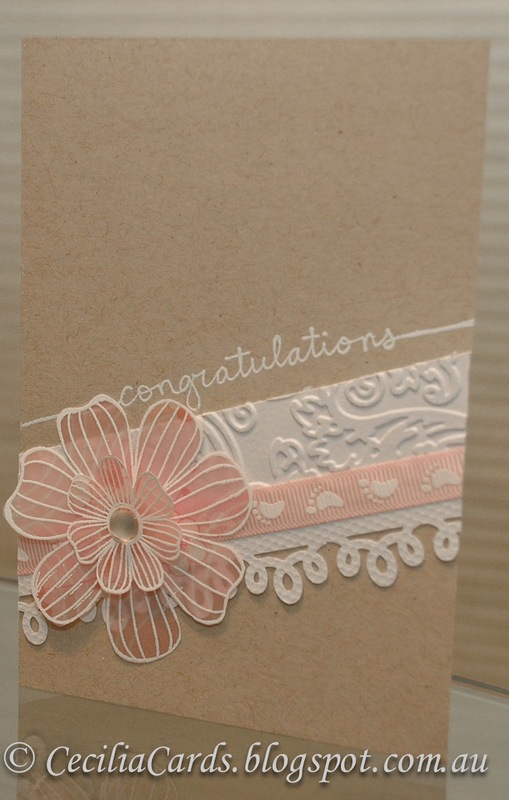 I originally embossed the vellum on white patterned vellum and was not happy with how it sits on the card. So I dug out some pink patterned vellum which has been in my stash for I don't know how long. I'm glad I'm finally able to use it and was happy with the end result! 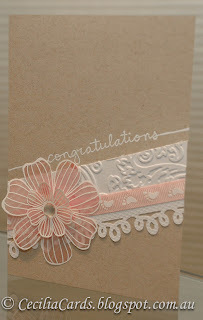 I have recently found some transparent mounting tape at Officeworks, which was perfect for the flower in this card. 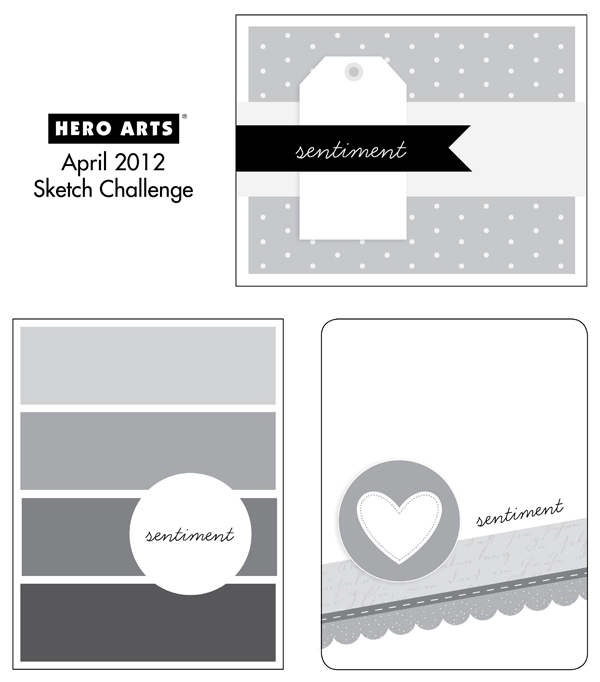 Both cards will be entered (at the last hour) to A Blog Named Hero's first challenge - play favourites , Simon Says Stamp - Use Your Favourite Tool (My Big Shot) and this month's Hero Arts April challenges. Both cards are fab! I especially like your first card with the butterfly background - lovely! Love both your cards, both are great takes on the sketches, I especially like your flower on the second one. The colors on the first card are great!!! Both of your cards are so lovely, but the baby girl card is just stunning. I'm speechless over that flower!! Found your beautiful butterfly card on Pinterest. Love it. What stamp did you use for the butterflies? Hi Dannelll, thanks for dropping by. 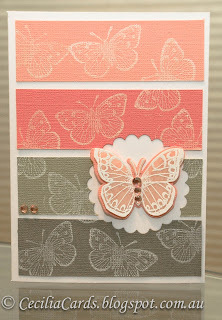 The butterflies are part of the Hero Arts Antque Flowers and Butterflies set, I have used them over and over again! I also found your card on Pinterest and I plan on using it at my card ministry session in June. Can you tell me the dimensions of the color rectangles? Hi Tina, I still have this card. Can't bear to give it away. The rectangles are 3x10cm and I used the Tim Holtz Distress card stock. Ooh, didn't realize this was from 2 years ago! Do you still know the dimensions of the cardstock pieces?